Just to let you know Margaret Thatcher died. I don’t believe in heaven or hell but if you do happen to bump into her in the afterlife, I’m sure you would be kind due to her dementia even though I know how much you utterly hated the woman and the devastation she wrought on the mining community you hailed from. Your dad was a miner but died before she came into power- I think you were glad of he never got to see what happened to the village you grew up in. I don’t think it’s nice to crow over someones death, I’d be sad if anyone was happy you died, even if you did have a knack of deliberately rubbing people up the wrong way sometimes. I’m not happy she died, if anything her dying has bought my own grief for you up. She was always in the periphery of my childhood and so I remember happier but hard and worrying times in the eighties growing up. I remember being very scared when the Falkland war started as I was convinced I’d have to be an evacuee, and we were about to get bombed! This was despite the fact we lived in rural Midlands. My primary school history lessons clearly had some kind of an impact. I also remember we all knew she stole our milk but then I never really understood that one- we had to pay 10p for a carton of slightly warm milk or a glass of apple juice at breaktime and when in year6 me and a few other girls were made milk monitors and were allowed a free drink for our troubles- except we kept nicking more and more milk and juice and the profits went down. Given I also wanted to be the next woman prime minister in Y6 maybe she had had more of an impact on me than I thought…. 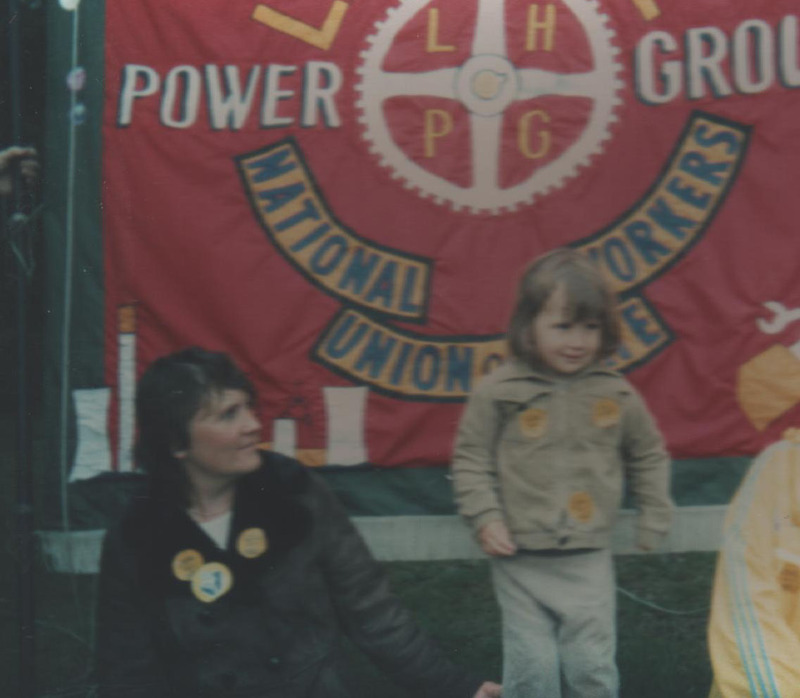 I don’t really remember joining you in solidarity on the miners strikes but I still have the picture from then (and you assure me I met and charmed Arthur Scargill aged three or four!). We still have the jigsaw somewhere made from this picture that mum got from saving up coupons from marmite jars. She would never let us actually do the jigsaw incase we lost a piece. It was recording history! Anyhow. You’ve gone, She’s gone, Joe’s gone, Both sets of Grandma and Grandpa’s have gone, Becci’s gone, Sam next door went yesterday, one day we will all be gone, ashes to ashes and all that. This entry was posted in Bereavement, LadyCurd, Things I Hate and tagged 80's, Death, Grief, Margaret Thatcher. Bookmark the permalink.